The British rock and pop quintet Snow Patrol, actually from Northern Ireland and Scotland, are of that rare breed: they make music that delights the mainstream but also maintain high lyrical and compositional standards. What they do is not throwaway: it’s for keeps. Hence their biggest selling albums, the mighty Final Straw and Eyes Open have pushed their sales to around 10 million copies worldwide and propelled them up global charts. Even their 2009 compilation, Up to Now, is certified triple platinum, and as people are still discovering the pleasures of their sound, exemplified in radio friendly classics like “Run” and “Chasing Cars” they are bound to be worth your attention. The last ever band to appear on Top of the Pops, Snow Patrol are a superb live act and were chosen to appear in the Hyde Park segment of 2012 opening ceremony for the London Olympic Games, widening their appeal still more. Blessed with myriad awards in Ireland they may be most proud of the fact that “Chasing Cars” was named ‘The Song of the Decade’ on Channel 4’s 2009 round-up: it was also the most-played song of that era. They have a plaque at the Duke of York pub in Belfast where they made their live debut. Needless to say they all turned out for the ceremony and played an impromptu set for a small crowd. Just like the old days. Formed in 1994 by chief songwriter Gary Lightbody with bass payer Mark McClelland and drummer Michael Morrison, who were all students at the University of Dundee, they flirted with band names the Shrug and Polar Bear and released two EPs independently before Jonny Quinn took over the kit. Working on their reputation as a live draw the newly-named Snow Patrol signed to Jeepster (home to Belle & Sebastian) for whom they recorded the first brace of discs – Songs for Polarbears (1998) and When It’s All Over We Still Have to Clear Up (2001). Evidently influenced by alternative American rock acts such as Pixies, Soundgarden and Dinosaur Jr. but with a weather eye on the more intriguing UK bands like Super Furry Animals – though in reality they don’t sound like any of them – Snow Patrol impressed listeners with strong songs like “Starfighter Pilot”, “Absolute Gravity” and “One Hundred Things You Should Have Done In Bed”. Quirky and distinctive by turn they continued to concentrate on indie rock with a twist and the lovely “Ask Me How I Am” indicated a change of mood. But it was the Ivor Novello Award winning Final Straw (2003) that pushed them beyond. Nathan Connolly’s arrival on guitar upped the power of the pop quotient considerably and Lightbody responded with a selection of definitive songs where the chorus always stuck: if you missed that disc then it’s worth discovering now because “Spitting Games”, “How to Be Dead”, the band-written "Chocolate” and the hit single “Run”, all produced by the group with noted Irish console master Jackknife Lee have a power to persuade that has lasted well beyond the initial impact of radio play. It also makes them superstars back home and will sell way over three million in the UK and the rest of Europe, plus making a healthy inroad into the US chart. The re-release with bonus cuts, iTunes and DualDisc versions are recommended. A change of personnel and an onrush to fame makes Eyes Open (2006) seem even more expansive. With Tom Simpson adding textures on keyboards, the additions of choir and strings (the latter arranged by James Banbury) now give Snow Patrol an epic soundscape to work upon. The huge seller “Chasing Cars” becomes a genuine signature piece. An unusual love song with just a little dark undercurrent – many of Lightbody’s other lyrics are tinged with deeply personal observations – this track took on a life of its own and ensured that Eyes Open would crack America. “You’re All I Have”, “Hands Open”, “Set the Fire to the Third Bar” (featuring Martha Wainwright) and the “Open Your Eyes” and “Shut Your Eyes” pairing are full of the anthemic power that make the Patrol interact with a crowd. A successful tour accompanying U2 is documented on the Special Edition Deluxe Box. Still with Lee at his desk Snow Patrol took the time to make sure that A Hundred Million Suns (2008) didn’t slacken off. Lightbody continues to offer heartfelt and poignant lyrics – “If There’s a Rocket Tie Me To It” and “Crack the Shutters” are up with his best – and the big noises emanate on “The Planets Bend Between Us”, a typical example of the group’s ability to home in on grown up subjects that appeal to their age group. A Deluxe Edition and Tour edition bonus DVD cover all the bases and the addition of strings and horns, featuring Guy Barker and Timothy Brown amongst others, throws extra sparkle over the winning melodies. The compilation Up to Now (2009) offers a chance to catch up on the hits as well as some other lesser-known tracks, including the Jeepster years as well as “Just Say Yes” one of three new pieces with an electronic, synthpop direction. This set is described by Lightbody as a chance to take stock and look back at a career not entirely marked by runaway success. The paean to Belfast that is “Take Back the City” is outstanding, another gem that always sounds great on the radio or when pulling a festival crowd to its feet. The much expanded Box Set version provides the more intimate side of Snow Patrol on a third disc recorded live at the Union Chapel, London. Here you’ll also find a cover of Sugarbabes UK number one “About You Know,” a change of pace that depicts the Snow men enjoying a slab of bright pop music. The sixth studio album Fallen Empires (2011) emerged from a period of writer’s block, though the wait was worthwhile. The Digital download hits “called Out in the Dark” (note the possible double interpretation), “This Isn’t Everything You Are” and the R.E.M. (specifically Michael Stipe) inspired “New York”, a lovely seeping piano ballad, are all highlights. We also have 2103’s Greatest Hits for discovery and on hearing this it’s easy to see why they have fans ranging from Stipe and Bono to Nikki Sixx, with the R.E.M. frontman also being an admirer of Jacknife Lee. At time of writing it’s good to learn that a new album is in the pipeline with drummer Jonny Quinn insisting that Snow Patrol are fully recharged and ready to reconvene in their 20th year. With so much great music already available it’s true to say that Snow Patrol are one of the jewels in the crown here. The prospect of another addition to the repertoire, and a possible live tour – well that’s going to be worth the craic. With Final Straw, Snow Patrol mainman Gary Lightbody seems to take all the inspiration he's gathered from the superstar collaborators in his Reindeer Section project and bundle it into a series of earnest bombastic rock ballads. Producer Garrett Lee deserves credit up-front for expanding the band's sound even further from the lush symphonic grandeur of When It's All Over We Still Have to Clear Up. Here, Lightbody and his cohorts traverse the same anthemic territory as Idlewild, with guitars cranked to the max. But where his friend Roddy Woomble of Idlewild soars all over the map vocally, Lightbody prefers the immediate and somewhat indifferent vocal style of another friend, Aidan Moffat of Arab Strap. Indeed, much of Final Straw feels like a middle ground between these two bands, if not for the violins, xylophones, and percussion Lee layers into the mix. Thanks to extra ornamentation, "Gleaming Auction" steps into the swirling realm of Rollerskate Skinny, as wobbly dynamics add interest to punishing guitars. If one gets the sense that Lightbody is shuffling through influences, ranging from all of the above-mentioned bands to Radiohead, Coldplay ("Somewhere a Clock Is Ticking" seems to be a more rocking cousin to Coldplay's "Clocks"), and even Pink Floyd (on the unmistakably Dark Side of the Moon-influenced "Same"), his mastery of mood and adherence to harmonies make for a consistently coherent and compelling 40 minutes. Highlights include the throbbing cacophony that is "Wow" and "Spitting Games," which seems like a cascading Wall of Sound feedback-free descendant of My Bloody Valentine. Final Straw is another strong slab of emotion and invigorating energy from a solid band that mixes its influences into an always heady sonic libation. The anthemic indie rock sound of Snow Patrol provides a bit of hope and promise among the many acts attempting to fit into a certain genre or scene. Snow Patrol belongs to their own scene, and their third album, 2004's Final Straw, proved that with several global hit singles such as "Run," "Chocolate," "How to Be Dead," and the reissue of "Spitting Games." British fans once more proclaimed their beloved Snow Patrol as a true rock & roll band while American audiences finally took notice of the Scottish collective. 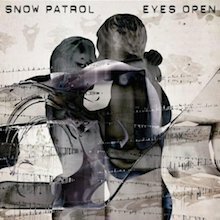 The band's fourth album, Eyes Open, doesn't fall short from where they left off; in fact, Snow Patrol's hungry rock sound only gets bigger and better this time around. All guitar hooks and singalong choruses are firmly in place, and Gary Lightbody is an underrated frontman. On Eyes Open, he once again writes songs that are from the heart and true to self-reflection without getting too sappy and too overjoyed. From the playful name-dropping of Sufjan Stevens on "Hands Open" to their passionate delivery on "It's Beginning to Get to Me" and "Shut Your Eyes," Snow Patrol's approach is epic. They are the kind of band that embraces simplicity as beautiful and human flaws as art. The lullaby-like "You Could Be Happy" and the passionate buildup of "Make This Go on Forever" are evident of that. This 11-song set is a masterpiece, so keep your ears and eyes open for Snow Patrol. They're onto something big. 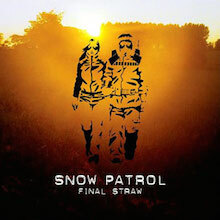 If Final Straw introduced Snow Patrol to the mainstream and Eyes Open cemented the band's popularity, then A Hundred Million Suns is the group's ultimate bid for stardom, its slick production and sonic uplift designed to maintain Snow Patrol's place in the charts. 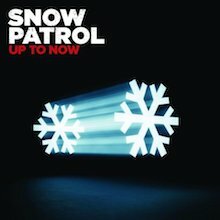 Like "Chasing Cars," the mega-single from Snow Patrol's previous album, tracks like "Take Back the City" and "If There's a Rocket Tie Me to It" are slyly repetitive -- their hooks are cyclic, each comprising only a handful of notes, and their straightforward familiarity helps maximize the songs' singalong potential. But A Hundred Million Suns also features more curve balls than the band's past catalog, from "Lifeboats" (an icy love song with synthesizer glissandos and falsetto harmonies) to "The Golden Floor," whose handclap-and-stomp intro recalls the light hip-hop flavor of OneRepublic's "Apologize." This is where Snow Patrol sound best -- at the intersection between marketable pop/rock and something more challenging, whether it's an unexpected arrangement or an interesting melodic turn. The band's appeal also owes a good deal to Gary Lightbody, who maintains his status as the least famous frontman of a very famous band. He's the boy next door, a musical Everyman who's just as average looking as Chris Martin and only half as desperately self-effacing. Looks may have little to do with an artist's music, but such appearances help ground Snow Patrol's music, even while "Take Back the City" and "Please Take These Photos from My Hands" reach for the same stars that U2 routinely grab. 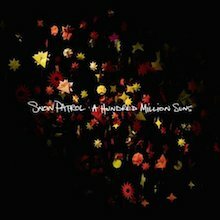 When A Hundred Million Suns focuses on music -- not saccharine radio fodder like "Chasing Cars," but actual music, with twists and turns that haven't been mapped out by generations of likeminded balladeers -- the album warrants Snow Patrol's existing fame, presenting a band that aspires to pop/rock grandeur without developing the accompanying ego. Up to Now is nothing if not a thorough album, with Snow Patrol diving headfirst into its vaults to compile a 30-track set of radio hits, rarities, new songs, and deep cuts. As a result, this reads less like a best-of compilation and more like a catch-up for those fans who climbed aboard circa "Chasing Cars," which began its joyride up and down the singles charts in 2006. Up to Now takes much of its material from that hit-making period, but it also reaches as far backward as 1998, demonstrating the band's growth and longevity in the process. For those accustomed to the band's straight-faced anthems, a cover of Beyoncé's "Crazy in Love" adds some humor to the mix. Three new songs are also included, with the slow-building, understated "Give Me Strength" standing out as one of the band's strongest tracks in years. Up to Now may be somewhat overwhelming for casual listeners -- it's quite extensive, with the traditional hits sprinkled throughout a double-disc track list -- but there's no better destination for a fan looking to consolidate his collection.